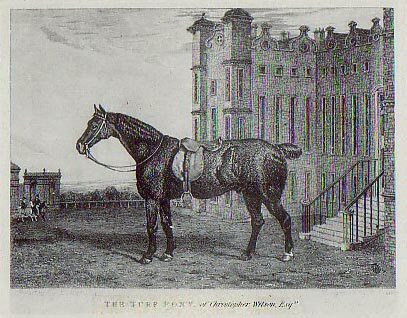 The caption at the foot of the print reads: THE TURF PONY of Christopher Wilson, Esqr. Painted by L Marshall. Engraved by E Babbage. I bought this copy of the print on eBay after seeking the original for more than 10 years! The seller thought it must have come from an old "Sportsman" magazine, but he was not sure, and its size and the lack of text on the other side suggest it is a book plate. It is shown in two of Sir Walter Gilbey's books, "Ponies Past and Present", and "Thoroughbred and Other Ponies" (1903) in which the caption reads: "A Pony Hack: A pony well known on Newmarket Heath and North Country racecourses, about 1828." The house at Rigmaden Park would have just been completed. The costumes of the two riding figures in the background support a William IV or early Victorian date. In 1822-23, Christopher Wilson of Abbot Hall, Kendal, bought Rigmaden Park outside Kirkby Lonsdale. He commissioned fellow Kendalian, George Webster, to design a new house built on the site of the "ancient manor house". "It is now a splendid mansion, standing upon a lofty eminence, which rises rapidly from the west side of the Lune, and commands a fine view of the vale." (Mannix). 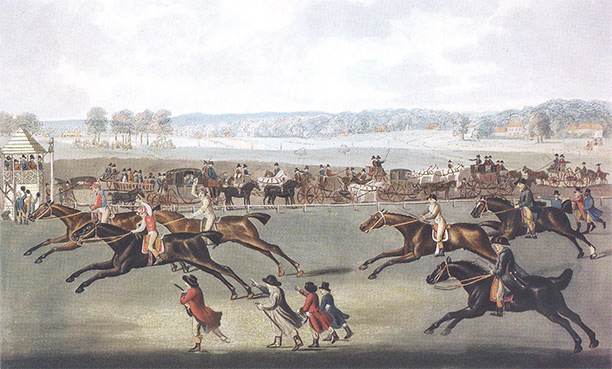 Painting of 1751 by John Sartorius of the Oatlands Sweepstake at Ascot. The gentleman on the right nearest the viewer, and the one on the bay with white foot and star, are not racing but spectating. Wilson used Fell-type mares to breed "turf ponies". (Richardson) These ponies were seen at most race meetings before grandstands were built. Owners, spectators or press could take up a position "on the rails" (if they existed!) and gallop alongside the runners for part of the race. If they didn't have a horse they ran! Turf ponies needed to be short and stocky to carry portly gents, but fast and enduring. They may have been a cross between a Thoroughbred or an Oriental breed and the local "Galloway" stock. North Country Galloways were part of the foundation of the Thoroughbred. As can be seen, the racehorses themselves were not much taller than the "turf ponies". "Neighbouring shepherds ... held festival, during which there were horse racing, wrestling and other such-like country diversions." 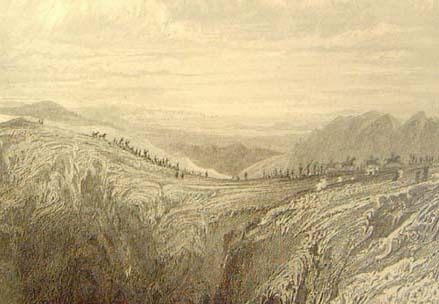 Thomas Allom recorded a similar event in his print shown here (published by Son & Co in 1835). I photographed this print, by permission, at Kendal Library in 2000, when I first built the Fell Pony Museum site. The traditional date of the shepherds' meet on High Street was 10th July. According to Garnett it was held until about 1835. Curiously, the local maps don't identify Racecourse Hill until the first Ordnance Survey in the 1850s. 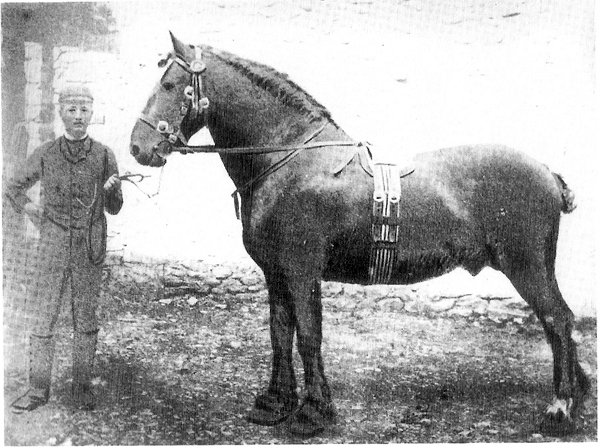 In the 1860s Tom Jones Evans of Craven Arms, Shropshire, brought his father Dafydd's brown (dark bay) Welsh cob stallion Trotting Comet up to compete against the trotting Fell ponies. Comet was foaled in 1851 and has been described both as "a heavy cob standing nearly 15 hands in height" and a "16-hand, dark bay". Trotting Comet was sired by an older Trotting Comet (834 HHSB); this older horse was "one of the founding fathers of Welsh Cobs" and was bred out of a mare named Black Bess, by Cauliflower. He was probably registration 1411 in the Hackney Horse Stud Book (Fitzgerald, 2000). Trotting Comet (junior) had been bred by Ellis Thomas of the Talbot Hotel, Tregaron, and in the north he was known as Comet Talbot. He was responsible for producing "the Comets", a type of large, active roadster out of Galloway mares, which sold for good money at horse fairs such as Brough Hill. Comet remained in Westmorland and, although Evans would not sell him, he was used extensively on the local stock (Richardson). A portrait, a very large black and white photograph, hung in the house at Bousfield and was shown to a Fell Pony Society Council meeting by Bill Potter in 2013: "a rough looking, common headed cob; you would never think, to look at him, the speed he must have had." (P Metcalfe) Given that photography was only in its infancy in the 1860s, the portrait photograph (sometimes said to be of Comet Talbot) is more likely to be a picture of his son Comet II or "young Comet". Certainly this is the caption on the copy of this photo in "Dales Ponies". He was said to have been out of a Galloway mare - in other words, he was a Welsh Cob/Hackney x Fell or Dales. There are pencil marks which outline the groom's clothing and the horse's legs where they had faded (the horse is not, as wrongly asserted in the American magazine 'Equus' in 2016, wearing any kind of boots!). He was bred by William Hully and could trot a mile in three minutes. William Hully bred Hackney or trotting galloway types from Comet II, and one of them, Daddy's Lad, was at stud at Great Musgrave near Kirkby Stephen for the season 1908, and later was exported to Argentina. Mr Hully also bred Fells that won local show classes in Westmorland in 1903. The family has bred Dales ponies up to the present day. Several Linnel Fell ponies traced back to Daddy's Lad, eg Linnel Boy and Linnel Lingcropper. R B Charlton (1952) remarked that Comet's descendants inherited his energy, soundness and stamina. However, there could be a down side to this bloodline, as some of "the Comet horses" were also known to be "a bit crackers". One ran away in harness into Orton with Bell's grandson at the reins; just outside the shop, it ran into the back of a wagon and killed itself.